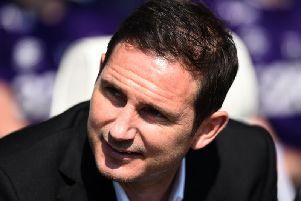 Chris Jones arrived at Pride Park with Frank Lampard and Jody Morris. Chris Jones says he's enjoyed his time at Derby County working alongside Frank Lampard and Jody Morris and putting his growing coaching knowledge to the test. Jones spent 12 years at Chelsea where he worked with a succession of top coaches in the game including Carlo Ancellotti, Jose Mourinho and Antonio Conte. And having largely been fitness coach at Stamford Bridge, he's now enjoying being more involved specifically in the football side of things. “I’ve really enjoyed it and it was a good time for a change for me,” Jones told RamsTV. “After all that time picking up the experiences of managers at Chelsea, it has been good to put all those together and work here with the guys and instil the ideas I have on how we train and contribute to how we play as well. “Part of the reason why Frank got me involved is probably down the line of seeing things a different way. I played at a lower level early and then went down the fitness route and coaching as well which I did from the start. It’s a mix of the two that I bring. “The manager likes to combine work on the field with a lot of video work, individual and as a group. It reinforces the messages and habit that he wants them to be picking up. We look back on the games, review them and look forward to the next ones and try to instil it on the training pitch. As with several of the Rams' coaching and playing staff, the opening day win at Reading was Jones' first competitive game with the club and it carries many good memories, Derby winning with virtually the last touch of the game. “It was a brilliant moment and it’s the best time to score,” he said. “It’s a great feeling when you put the work in, push the players and will them to win, and then you score in the final period then it’s just a brilliant release of emotion. “It’s been a good start to the season so far. It’s been a busy time with a lot of games in this first block leading into the first international break. There have been some changes in the playing staff and the way we have played so there has been a load of changes we have instilled. Jones has also been impressed with the young talent coming through at Pride Park, with Jayden Bogle and Max Bird having already gained appearances in the first team. “A big part of our work is to integrate throughout the club and we bring up the young players when we can and we look forward to it,” Jones added. “We show them the way we are playing and instil the mentality that we are passing on to the first team group so it filters down. It’s satisfying when we bring young players over and they do well and thrive in the sessions. “We look for players with enthusiasm and quality. It’s been brilliant to see how well Bogle has been doing in games. He had an injury against Preston, but he was brilliant up until that point. He has been a real highlight for us.